• The power cord is long enough for you to use your devices while charging and you are not constricted by a cord going to the wall. Compact design makes it easy for storage&travel. Certified Safe : Multi-protect Safety System protects your devices against excessive current, overheating, and overcharging, short circuit protection; CE Certified. Compatible with iPad, iPhone, Smartphones and Tablet. 1 x 5-port USB charging station (base). 【Safey Certificates】USB Charging Station CE / RoHS / FCC Certificates,Overheating and short circuit protection, Suitable for modern household and office use. 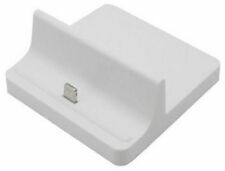 This is a charging dock stand for use with any apple lightning device. This dock allows you to connect your iPhone or iPad to a dock so you can prop your phone up! Easy set up simply plug the dock into a lightning cable. Never look for your cable again, just plug your device on the dock and leave it while it is charging. Lightning Docking Station for iPhone X/XR/XS/8/7/6/6S/6S Plus/6Plus/5/5S/5C, iPad Air, iPad Mini etc. Compatible with iPad, iPhone, Smartphones and Tablet. 【Safey Certificates】USB Charging Station CE / RoHS / FCC Certificates,Overheating and short circuit protection, Suitable for modern household and office use. Looks good and elegant, perfectly decorates your bedroom, study, hall, office desk. This product is made of premium silicone material with soft finish, keep your Apple devices from scratching. Work as a station for Apple Watch, a stand for Airpods, a holder for iphone. (B.) Works with all Apple Watch models, iPhone & iPad. A.) 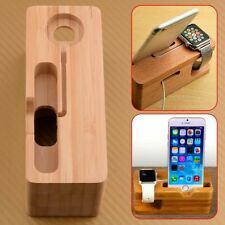 This solid bamboo stand allows you to place your watch, cell phone & iPad at a comfortable viewing angle. Compatible Model: Apple Watch 38mm and 42mm, iPhone and iPad. Designed to be solid structure with the high-quality bamboo, so that smooth surface of the bamboo not scratched tablet devices. --Premium Bamboo Multi Device Storage and Charging Station. --4 smart phones can be put in front, and one laptop or tablet can be put on the back. Apple iPhone 6S. Apple iPhone 6S Plus. Apple iPhone 5S. Apple iPhone 5C. Apple iPad mini 4 / iPad mini 3 / iPad mini 2 / iPad mini. 2-In-1 Features: Hotsync & Charging. Connect your iPhone with your PC/Laptop by USB port. Keeping your Smartphone,Tablet and other devices organize on your desktop or counter. It can steadily hold all your devices. Note: Charging cables,smartphones and tablet are not included. Color: Black. Cord organizer High grade wearable Bamboo, smooth texture, delicate and comfortable touch,It has an elegant appearance. • Material: Bamboo. • 1 Bamboo Multi Function Stand. Clear up your cables in a regular way. Size: 18.5 11 8cm (with iwatch stand height). This solid bamboo stand allows you to place your watch, 2x cell phones & iPad at acomfortable viewing angle. It works for both the 38mm and 42mm Apple watch. Type:Phone/Tablet Stand. Stand Size:approx.17 13 9(while installed). 1x Phone/Tablet Stand. The real color of the item may be slightly different from the pictures shown on website caused by many factors such as brightness of your monitor and light brightness. Stylish and functional charging stand for iPad Pro Apple Pencil. - Put the pencil cap into the resting spot when charging to avoid losing it. A 3-year warranty is promised, your satisfying is our ultimate pursue. 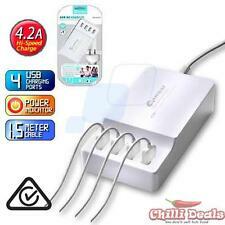 Leitz 3-Port USB Powered Charging Dock Station for Mobile iPad iPhone White V4C. 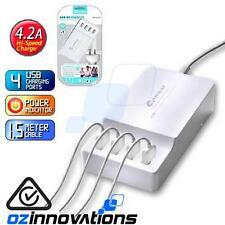 Leitz 2 Port USB Power Charging Dock Station for Mobile iPad iPhone Garnet Y2RM. 1 x Charging station. - With 5 Smart Identification USB ports in one centralized location, you avoid the clutter of cables and wires. - Ultra compact and space-saving. 1 x Plug Cable. Due to the difference between different monitors, the picture may not reflect the actual color of the item. Desktop Charging Station. Condition is New Has been opened to photograph, Unwanted gift. four up to four devises at once. Solid Bamboo wood. For iPhone, Android, Samsung, iPad, Nokia. 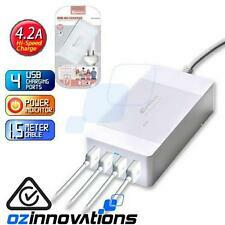 It supports all 5V output devices based USB interface, 50 watt for stable and high speed charging. Input 50\60Hz 0.8A. Total Current 5V-- 9A(Max). Weight 160G. Features:•Fast charging:6 USB ports: 5V/2.4A output each port, total 10A(Max).•Smart charging, the built-in intelligent chip identifies smartly the connected devices and offer exact current charging,no need to select this or that port for phones and tablets.•Foldable baffles and anti-sliding slots makes perfect space saving and cable tidy.•Super Fast Charging: 6 ports EACH 5V 2.4A output, allows you to charge 6 devices simultaneously always at high speed.•Wifi Remote Control Charging: Follow the instruction to install the APP in your cellphone then you can remote control power on or off the charging station, anytime and anywhere, to protect your devices from being damaged or even burnt by over charging•SMART CHARGING: The built-. Ultra-Portable, Versatile, & Powerful. - Total Output Power: 60W (Max). We're very confident that you'll love your new charging station, and you'll will continue to enjoy its benefits. THE PREMIUM UNRIVALLED QUALITY 6-PORT USB CHARGING STATION WITH QUALCOMM QC2.0. Children Kids Earphones Headset Wired MIc Headphones fits iPad PC Laptop Tablet. Compatible with iPad, iPhone, Smartphones and Tablet. UK PLUG Hot Pro Ceramic Hair Curling Wand Salon Curlers Tong Styler 5 or 6 Sizes.